Preparing the presentation of 12 classics of the 20th century for my London College of Fashion students, I was struck by the utter consistency of the message they gave out: the scent, the bottle, the box, echoed the couturier’s style. Chanel N°5 even managed to predict the direction Gabrielle Chanel was to take (the Little Black Dress was still 4 years off when it was conceived), and though Yves Saint Laurent’s Opium may mark the end of an era with a Chinese-themed couture collection conceived, possibly for the first time, to back up a perfume launch, it was still very much the couturier’s brainchild. The house of Chanel probably survived the fallow late 60s and 70s, and up to Karl Lagerfeld's arrival, thanks to N°5; and clearly, fragrances (along with cosmetics and accessories), are what sustain fashion houses financially. John Galliano’s Dior couture extravaganzas are there to push bags, sunglasses, lipsticks and bottles of Miss Dior Chérie. Thierry Mugler’s best-sellers are all that remain of the house that made the front pages in the 80s and 90s. Some brands do show great consistency between scents and runway. Narciso Rodriguez’s fragrance line echoes the sleek, urban, no nonsense feel of his designs. Prada’s is a great olfactory translation of Miuccia’s “too brainy and chic to go for man-pleasing ploys” sartorial codes. Kenzo’s perfumes reflect the joyous, multi-ethnic riot of colors and prints Kenzo Takada unleashed on the fashion world in the 70s. But Lanvin… Lanvin’s fragrances just make me cringe. Granted, the house went from hand to hand and managed to let go the fabulous fragrance name Scandale (now owned by Roja Dove). Hiring Alber Elbaz when Tom Ford ousted him from Yves Saint Laurent was a brilliant move. Elbaz’s designs have a grace, a dignity, an easy femininity that says “woman with a real life” without forsaking edginess and chic. I own a few of his pieces (as well as some of his YSL stuff) and they just seem to sail through the years timelessly. Maison Martin Margiela’s Untitled is a somewhat better fragrance. But, as Octavian Coifan pointed out in his review, it smells like the Prada that never was – unsurprisingly since its author, Daniela Roche-Andrier, has signed the entire Prada fragrance line. Its green/smoky accords – with a roasted note that brings to mind Hermès Vétiver Tonka at times and a reminiscence of Chanel Sycomore – are infused with that trademark Prada soapiness. Not bad, though a little thin and with a sour note that pops up. But not Margiela. 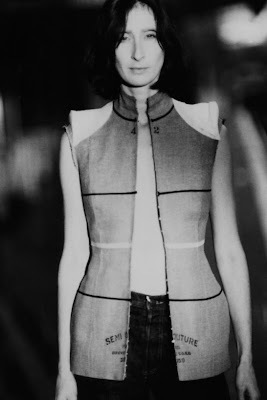 My sources say that Martin Margiela himself was personally involved in the project. In fact, this was his last involvement in the house he founded and has now left. The very name of the fragrance, Untitled, is consistent with his anonymous labels – off-white pieces of ribbon sewn inside his garments, though those in the know could always tell a Margiela piece by the four off-white stitches that showed up at the back of the neck. The choice of a plain lab bottle matches his sales assistants’ lab coats. But, hey. Untitled is the name of about seventy million artworks. And plain lab bottles? Hasn’t that been done ever since Coco Chanel pretended she’d picked them for N°5 (even though it was actually a design by the glassmaker Julien Viard, whose milliner wife had worked with Chanel)? Untitled reflects none of that edginess, a fact that can be put down to the brand’s new owners, Diesel, and the company that holds the license, L’Oréal. Even its green note is more on-trend than groundbreaking. They should have gotten Christophe Laudamiel. But then, they might have come up with something disconcerting. And disconcerting doesn’t make money, does it? Untitled is, for the time being, exclusive to Colette in Paris. It will be launched world-wide in March. To the person who left the comment I deleted: I'm sorry, but I'd rather not have comments with a commercial link added. While many fragrances of Daniela are very commercial indeed, or as you say very "Prada", '(untitled)' really is an exception, and no typical Daniela juice that tend to be complex, ionony and sticky. First galbanum in such a dosage is dary, as dary as Germaine's 'Vent vert' was in 1945, and after failures like Calvin Kleins 'Truth' or 'comme des gracons 3' green is very off-trend today. Juxtaposing it to a transparent white musk accord with an overdoes of 14% (!!) Serenolide is as innovative as the aldehyde complex in N°5, or even more as aldehydes were in already in 'Quelques Fleurs' before N°5. This white/green contrast is radiant, lush and sharp, and most lively indeed. It smells like when you chop Angelica roots in the middle of the field and destill them down to the resinous musky late-night fractions, totally lovely and unparalleled in today's perfumery (perhaps some reminiscence to the male fragrance Tactics of Shiseido). Even packaging and bottle design are untypical for L'Oreal, and Martin had a strong word to say here, against much resistane. The forms are simple, the bottle repeats the green/white contrast of the scent, comes in a practical white sack, and unpretentious white carton box, and it's megacool to cut the ribbon to get to the juice. Just like you should cut the white labels from the MMM clothes as people never do to show off its MMM. Yes, L'Oreal is a commercial company, yes, Martin left and Renzo took over in a very commercial way, and yes Daniela usually does commercial stuff. But '(untitled)' is exceptional in focussing all the attention on the product, on the white/green contrast. It is avantgarde, while highly wearable, and to me Martin's last true masterpiece. He had to fight severe battles with the marketing people to get this through, and it shows that sometimes you can be innovative even in a commercial environment -- but it is easy to be stereotypical and not judge the product but the people who made it and the commercial environment. I would have appreciated more focus on the product, just as Martin does, less on stereotypes. And finally '(untitled)' is MMM's most affordable product, but maybe that's the problem as for once it is not elitarian as the four white stitches are '(unvisible)'? Anonymous, thank you very much for your input. You clearly have inside information about Untitled, know the people involved since you call them all by their first names, and know a great deal about perfumery. You obviously feel very passionately about it and I would guess you have a stake in it at some level, which makes your comment all the more valuable. I particularly love the smell of angelica and didn't think of it when I wore the scent, but then, as Colette doesn't give out samples, I had to rely on a skin test and scent strip, which is why I didn't dedicate an actual review to it. I'll keep it in mind when I try it again. Perhaps other stores will deign to distribute samples when the scent is launched worldwide. But I beg to differ about green being off-trend, as the launch of Cristalle Eau Verte and A Scent by Issey Miyake demonstrate, just to mention the mainstream ones. Perhaps the juxtaposition of a galbanum overdose (done in, what, 1947?) and an overdose of musk (which characterizes several mainstream fragrances) is radical, and I missed the point completely. And only time will tell if a template was created, as it was with Chanel N°5. Maybe focusing attention on the product is exceptional at L'Oréal but it tends to be the rule in the better niche houses: I can imagine Martin Margiela had to put up a fight, though. I don't quite see which stereotypes come into this. Or being snobbish about prices. Of course perfume is practically always a design house's most affordable product: that's the whole point. To put the dream within reach. And you're right, I've never seen anyone cut off the label! God knows I see the little offwhite stitches all over the place when I go to gallery preview shows. It seems that it is the same comment on my blog. I will just add several other things. I do not think that the perfumes Daniela Andrier did for Prada are "commercial" with that bad connotation often associated with fragrances made at l'Oréal or P&G. On the contrary, they were special and brought something relevant. That's why I and maybe other recognized the Prada "fingerprint". You speak about the packaging that is not pretentious and cool. It is funny to see all that near Le Labo at Colette. They did that several years before (and it is nothing new at all), even cosmetics (organic) do that. But I believe Margiela himself is less aware of fragrance "innovation". I appreciate you consider it avangarde, but compared to what? To CDG, EgoFacto, ELO, The Mirror fragrances of Mugler or compared to D&G Anthology? "I would have appreciated more focus on the product, just as Martin does, less on stereotypes." I do not think that any perfume blog has ever exposed stereotypes or judged other things than the perfume itself. "untitled" might be innovative to a young fashion public that has never experienced some true contemporary creations (concept + juice + aesthetic). But for those who are IN perfumes it is a very different story, set in a very green 2010 trend. This blog and mine were rather critical about this perfume for a very simple reason. We were both in fashion and we know quite well the MMM universe to have rather different expectations from a master. Octavian, I agree that Daniela Andrier infused a particular style to Prada fragrances which set them apart from most designer brand perfumes and give them a distinct olfactory identity: I wouldn't call them "very commercial" either, though they sell well (it's not the same thing). The fashion world doesn't always know much about innovation in perfume, and vice versa (something I am attempting to remedy on a very small scale through my courses for future fashion designers at the London College of Fashion). Which explains, perhaps, why Untitled may have come off as a groundbreaker seen from the fashion side of the spectrum. It isn't. And as you say, O., seeing the MMM lab bottle next to the Le Labo display put paid to the idea that it was in any way innovative. Perhaps the marketing people in perfume (at least at L'Oréal) should also look a bit at what's being done outside of their direct competitors before they start making such claims. I have a couple pair of Margiela trousers. My partner demanded that I cut off the four white stitches in the back. I said: "But the stitches are an inside joke -- the anti-label label!" He said: "I don't care if they're the golden ticket to Willy Wonka's chocolate factory, cut them off. They look stupid." I still wear and love my Margiela trousers just as much without the anti-label label attached, and I suppose that's really the point. Fashion doesn't need a label to be loved. This is partly why I treasure my Margiela items, because they don't scream "Margiela" at the top of their lungs. This perfume release, however, doesn't have any of that quiet subversion. As you and Octavian have pointed out, it actually lags behind the leaders of the fragrance pack in both scent and presentation. Not pushing any boundaries, or challenging any preconceptions. I would have loved a genuine anti-commercial, anti-label perfume from the Margiela name. But it wouldn't have made any money, which would have defeated the purpose for Diesel and L'Oreal. Laudamiel would have been the perfect Margiela perfumer.